From the end of the future I-73 and I-74 Rockingham Bypass, the two routes are to travel east along the US 74 Rockingham-Hamlet Bypass freeway south of Rockingham. I-74 is to run the entire length of this freeway which runs a total of 13 miles from north of Cordova to east of Hamlet and was opened in November 2000, costing $110 million.1 I-73 was originally going to leave the highway along a new freeway alignment for US 1 but this was changed after an agreement with SCDOT in February 2005. With the July 19, 2007 announcement of the preferred I-73 corridor from US 74 to I-95 from SCDOT (see I-73 Segment 13), I-73 is now to run approximately 10 miles to just to the east of the current NC 38 interchange. The section of the freeway east of the US 1 exit was originally signed as Future I-74 and US 74 until 2016, including signs at the entrance ramps on intersecting highways (see photos below). 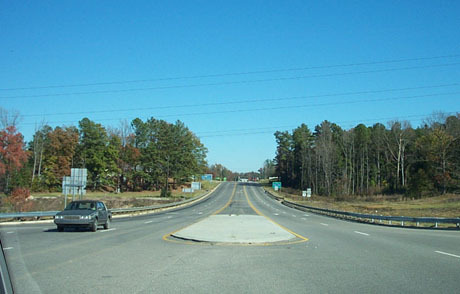 This roadway was thus the second section of I-74 to be signed with US 74 after the Laurinburg Bypass (see I-74 Segment 15). When the Bypass was chosen as part of the Future I-73 corridor it was assumed Future I-73 signs would be posted with the existing Future I-74 signs along this stretch of highway. However, in the fall of 2016, NCDOT removed all the existing Future I-74 signs along the Bypass and at the interchange ramps indicating they now don't plan to sign the highway I-73 or I-74 until the segment is connected to the planned I-73/I-74 Bypass (see I-73 Segment 11). The future Bypass is planned to intersect the freeway two miles west of US 1 near the current Zion Church Road interchange, but currently there no Begin or End Future interstate signs marking the exact spot, unlike along US 220. The freeway has exit numbers matching US 74's mileage which run from 311 at the US 1 interchange to 319 at NC 38, which, presumably would change to I-73 mileage when signed as an interstate. For more information go to the I-74 Exit List. A view of exit signage from US 74 West. The Future I-74 (and perhaps Future I-73?) 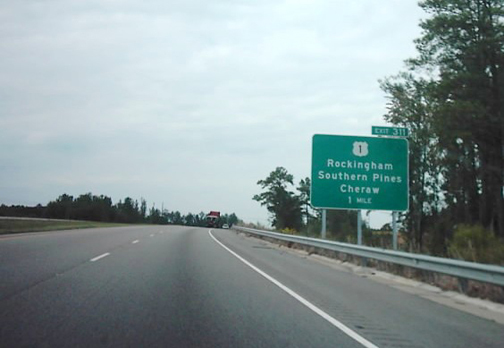 signs end at the US 1 exit westbound and begin there eastbound (Photo courtesy of Chris Lawson, 2006). 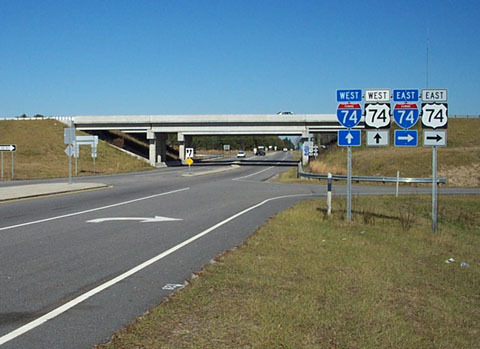 Signage at Ramp from NC 38 North to East Future I-74/US 74. I-73 will leave the highway here at a revised or separate interchange to the east. The Future I-74 signs were removed in the fall of 2016 (November 2002). A closer look a the Junction Future I-74/US 74 signage along NC 38. The Future I-74 shields were taken down on the fall of 2016 (November 2002). 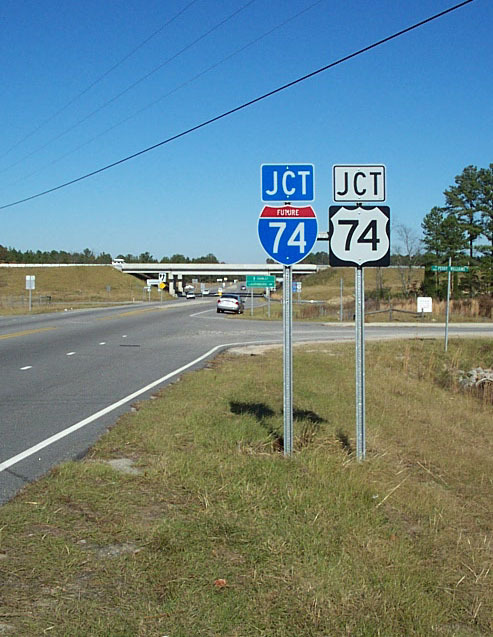 *It was assumed with the new official I-73 routing, Future I-73 shields would be put up along the highway some time in the future, however, in the Fall of 2016 NCDOT removed the existing Future I-74 signs, making it doubtful they will put up any new signs until the segment is an official interstate by being connected to the rest of the I-73 corridor, which is at least 10 years away. Sources-Map image:NC State Transportation Map, 2017-2018. I-73, I-74 and US 74 shields courtesy of David R. Kendrick's Shields Up!